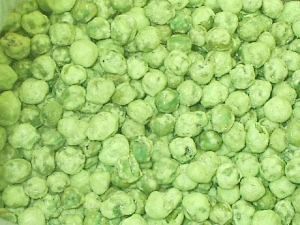 Green peas, glutinuous rice flour, corn starch, sugar, salt, soy bean oil, wasabi, artificial colors: US FD&C yellow 5 & blue 1. **Contains: Soy Ingredients. **May contain traces of peanuts and other tree nuts.